Brianna Turner defends Napheesa Collier. Photo courtesy of Connecticut Athletics. 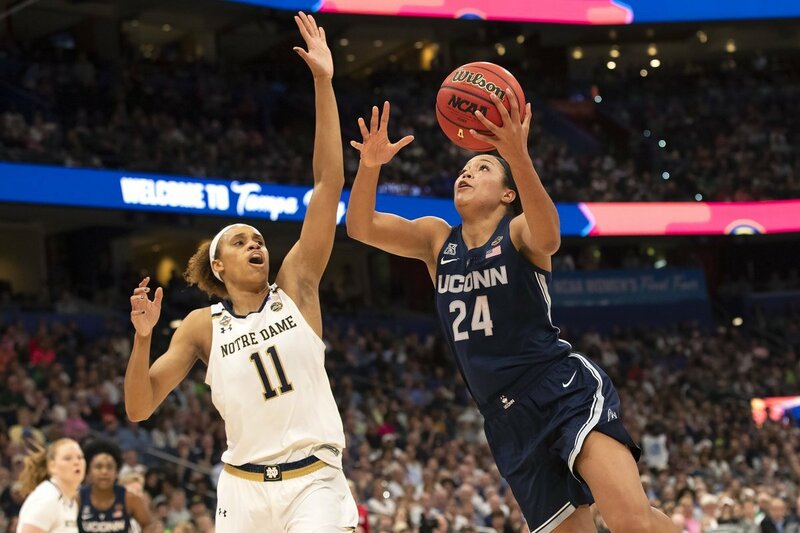 Tampa, Fla. – Down nine points early in the fourth quarter Friday, defending champions Notre Dame rallied past arch rival Connecticut, 81-76, to return to the title game. It was the second year in a row that the Irish downed the Huskies at the semifinals. Arike Ogunbowale, who won the game last season on a buzzer-beater shot, scored 14 of her team-high 23 points in the final frame. Jessica Shepard had 20 points and 13 rebounds and Brianna Turner, 15 points and 15 boards. Marina Mabrey had 12 points and dished 12 assists. The game featured 26 lead changes, and sends Notre Dame to face off with Baylor in two days. Irish coach Muffet McGraw praised Turner, in particular, who broke the school’s blocks record after posting five on the night. Ogunbowale said their scoring outburst began on the other side of the floor. 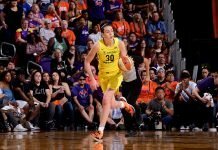 Katie Lou Samuelson led four Connecticut starters with 20 points, while Christyn Williams had 19. Samuelson said the Huskies’ defensive lapses cued their breakdown. “We knew that they make big plays. When it came down to it, we didn’t get the stops we needed,” she said. Connecticut coach Geno Auriemma said they were prepared for an Ogunbowale scoring run, but weren’t able to execute for themselves. Notre Dame won their second Championship in program history last year on Ogunbowale last-second shots in both the semifinal and final game. Sunday’s title game is a rematch of the 2012 final, which Baylor won to cap a 40-0 season.